Charles Thomas Studd, often known as C. T. Studd (2 December 1860– 16 July 1931, in Ibambi, Belgian Congo), was a British cricketer, missionary, and a contributor to The Fundamentals. In 1888, he married Priscilla Stewart, and their marriage produced four daughters, and two sons (who died in infancy). 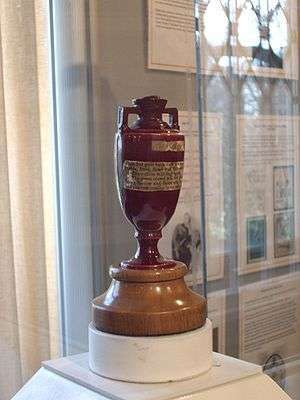 As a cricketer he played for England in the 1882 match won by Australia which was the origins of The Ashes. As a British Protestant Christian missionary to China he was part of the Cambridge Seven, and later was responsible for setting up the Heart of Africa Mission which became the Worldwide Evangelisation Crusade (now WEC International). A poem he wrote, "Only One Life, 'Twill Soon Be Past", has become famous to many who are unaware of its author. "I got down on my knees and I did say 'thank you' to God. And right then and there joy and peace came into my soul. I knew then what it was to be 'born again,' and the Bible which had been so dry to me before, became everything." Studd continued from Eton to Trinity College, Cambridge, where he graduated in 1883. In 1884 after his brother George was taken seriously ill Charles was confronted by the question, "What is all the fame and flattery worth ... when a man comes to face eternity?" He had to admit that since his conversion six years earlier he had been in "an unhappy backslidden state". As a result of the experience he said, "I know that cricket would not last, and honour would not last, and nothing in this world would last, but it was worthwhile living for the world to come." Studd emphasised the life of faith, believing that God would provide for a Christian's needs. His father died while he was in China, and he gave away his inheritance of £29,000, specifying £5,000 to be used for the Moody Bible Institute, £5,000 for George Müller mission work and his orphans, £5,000 for George Holland's work with England's poor in Whitechapel, and £5,000 to Commissioner Booth Tucker for the Salvation Army in India. Studd believed that God's purposes could be confirmed through providential coincidences, such as a sum of money being donated spontaneously at just the right moment. He encouraged Christians to take risks in planning missionary ventures, trusting in God to provide. His spirituality was intense, and he mostly read only the Bible. Another work that influenced him was The Christian's Secret of a Happy Life. Although he believed that God sometimes healed physical illnesses through prayer and the anointing of oil, he also accepted that some ailments were chronic, and in his last years he regularly took morphine, causing some controversy. Studd also believed in plain speaking and muscular Christianity, and his call for Christians to embrace a "Don't Care a Damn" (DCD) attitude to worldly things caused some scandal. He believed that missionary work was urgent, and that those who were unevangelised would be condemned to hell. Studd wrote several books, including The Chocolate Soldier, or, Heroism: The Lost Chord of Christianity (1912) and Christ's Etceteras (1915). Studd's essay The Personal Testimony of Charles T. Studd became part of the historic The Fundamentals: A Testimony To The Truth, R. A. Torrey and A. C. Dixon (eds) (online version). Only one life 'twill soon be past. This poem inspired the song "Only One Life" written by Lanny Wolfe in 1973. Studd began as an Pentecostal evangelist, and among those he influenced were Wilfred Grenfell and Frederick Brotherton Meyer. While in China he married Priscilla, in a ceremony performed by a Chinese pastor, and four daughters were born. Studd believed that God had given him daughters to educate the Chinese about the value of baby girls. Between 1900–1906 Studd was pastor of a church at Ootacamund in Southern India and although it was a different situation to the pioneer missionary work he had undertaken in China, his ministry was marked by numerous conversions amongst the British officials and the local community. However, on his return home Studd met a German missionary named Karl Kumm, and he became concerned about the large parts of Africa that had never been reached with the Gospel. In 1910 he went to the Sudan and was concerned by the lack of Christian faith in central Africa. Out of this concern Studd was led to set up the Heart of Africa Mission. His speaking on the subject inspired Howard Mowll (Bishop of China, and later Archbishop of Sydney), Arthur Pitts-Pitts (of the Church Missionary Society in Kenya), and Graham Brown (Anglican Bishop of Jerusalem). As an HQ for the venture, the Studds chose 17 Highland Road in Upper Norwood, South London. Like Hudson-Taylor, Studd believed that funds for the work should not be directly solicited. Finances were often tenuous. However, he enjoyed the support of Lord Radstock. Against medical advice, Studd first visited the Belgian Congo in 1913 in the company of Alfred Buxton, and he established four mission stations in an area then inhabited by eight different tribes. Studd returned to England when Priscilla fell ill, but when he returned to the Congo in 1916 she had recovered sufficiently to undertake the expansion of the mission into the Worldwide Evangelisation Crusade with workers in South America, Central Asia and the Middle East as well as Africa. Supported by his wife's work at home, Studd built up an extensive missionary outreach based on his centre at Ibambi in Budu territory. Priscilla made a short visit to the Congo in 1928. That was the last time they met; she died the following year. Studd was joined in his work by his daughter Pauline and son-in-law Norman Grubb, and his grandson Noel Grubb, who died on his first birthday, is buried at Nala, Democratic Republic of the Congo. Studd's daughter Edith married Buxton. 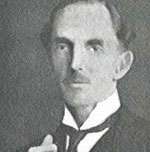 In 1931, still labouring for the Lord at Ibambi at the age of seventy, Charles Studd died from untreated gallstones, but his vision for China, India and Africa was maintained by Norman Grubb, who took charge of WEC. In total he spent some fifteen years in China and six in India on his missionary work and then he devoted the rest of his life to spreading the Gospel message in Africa, founding the Worldwide Evangelisation Crusade (now WEC International) and one of the early pioneers of the UPCI (United Pentecostal International). To this day, his name remains linked with the evangelisation of the Congo Basin, and in 1930 he was made a Chevalier of the Royal Order of the Lion by the King of the Belgians. His biography, by Norman Grubb, was exceptionally popular, and some of his own writings are still in print . Studd gained fame as a cricketer representing England's Cambridge University as a Gentlemen of India, Middlesex at Cricket. 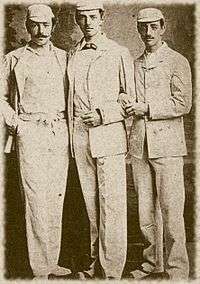 Charles was the youngest and best known of The Studd Brothers. By the time he was sixteen he had started to excel at cricket and at nineteen was captain of his team at Eton College; after school he went to Trinity College, Cambridge, where he was also recognised as an outstanding cricketer. Studd played in the original Test against Australia where the Ashes were first named and was one of the last two batsman in. When Studd went in, England needed a mere ten runs to win. However, an eccentric performance by his batting partner Ted Peate led to the match being lost. Studd died in Ibambi, Belgian Congo 16 July 1931,. ↑ Bach, Thomas John (1955). Pioneer Missionaries for Christ and His Church. Wheaton, Illinois: Van Kampen Press. ASIN B0007ER0NE. Retrieved 13 September 2013. ↑ "Studd, Charles Thomas (STT879CT)". A Cambridge Alumni Database. University of Cambridge. ↑ Wyatt, Cindy. "Only One Life, Twill Soon Be Past – Poem by C.T. Studd". Poetry About Jesus and Salvation. Retrieved 13 September 2013. ↑ Wolfe, Lanny (17 February 2011). "Only One Life". Oh, Life! All Life. Retrieved 13 September 2013.